If you haven’t seen The Lego Movie then you don’t live with an 8 year old boy. I have seen the movie twice and I enjoyed it (I am not kidding). Taco Tuesday features prominently and I think most Americans enjoy their own “taco night” maybe even more than once a week. Why? Tacos are easy, fast, and you can sneak all sorts of vegetables in there. I feature a recipe in my book – Healthy Tacos With A Twist – that I use a lot. When you have time to plan, this recipe for slow cooker chicken taco filling is SO easy. The nice thing about it is that it combines corn and beans with the chicken so you get a “stew like” filling with many flavors. Also, you sneak in some corn and beans with the chicken meat (which is very lean) so this is low in calories when compared to cooked ground beef. This made enough for my family of four and then some. We froze over half of it for another night. What do you do to make “Taco Tuesday” more interesting? Place chicken in the bottom of a 6 quart slow cooker and sprinkle seasoning and garlic on top. Add the beans, corn, and salsa and cook for 6 hours on low or 3 hours on high. After the filling has finished cooking, take two forks and shred the chicken. 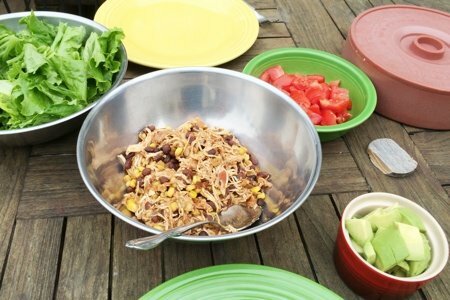 Serve with taco shells, chopped avocado, tomato, and lettuce. This is my favorite way to make chicken tacos, in fact we just had this last night! I also enjoy just serving it over rice. This is a great weekday recipe. Thanks for sharing with us. I have been wanting to make a recipe like this for such a long time. I guess this is a sign to go ahead and do it. I Purchase Small size (5.5") Corn Tortillas. Since They Almost Always Break I Quarter (Else I Third) them. Whichever (Mexican Else Chinese)filling upon them Then have Corn Tortilla "Canapes's" (4). If They Are Cut Into Thirds Then I Fold Them And Have "Mini" Corn Tacos (3). One Thing About Corn Tortillas. No Matter What The Application They Always Seem To Work Better With 3/4 tspn. Of Salted Light Butter. Looks great, Lisa. I'll forget about the taco seasoning (too much sodium for me) and I'm sure it will be just fine with all the flavor from the salsa. Readers who want a basic chicken taco filling might like Chicken Tinga from slender kitchen.com. Thanks again! This is a great recipe! Making your own taco seasoning is easy and no preservatives or additives. Chile powder (mild), cumin, oregano (Greek), a little garlic salt is all you need. Mexican oregano is too pungent for most people's taste so use Greek or use just a pinch of Mexican oregano otherwise it will overpower the dish. Pork roast is a very low calorie substitute for chicken and no hormones. Traditional Mexican carnitas (pork) tacos are what we eat. I make a pico de gallo (salsa) to go on top. Tomatoes, scallions (green part) and lots of cilantro. Also, some people like a little squeeze of lime on the taco meat or lime juice added to the pico de gallo. We don't use taco seasoning because that is a commercial invention for non-Mexicans and we never use it in traditional Mexican cooking. For carnitas, cook your pork roast as usual, shred or "pull" it then use for tacos. If you like it crispy, put the shredded pork under the broiler or fry it dry on top of the stove with no added oil. This is the traditional Mexican way popular mostly in California and Northern Mexico. Living in Texas, it is hard to find good traditional Mexican food so I must prepare it at home. Tex-Mex food just does not cut it for us. Most of the private Mexican families make their own Mexican food. We make chile rellenos, homemade enchilada sauce for our enchiladas, pork tamales, sweet corn tamales, refried pinto beans (frijoles), carnitas, pollo en mole (chicken in chocolate/chile sauce), and Mexican rice primarily. Most properly prepared Mexican foods are not spicy hot. That is something each individual adds according to their taste. To make it hot I use hot sauce, chipotle, cayenne, Kashmiri chile powder or New Mexican chile. I only use jalapenos as a condiment. Enchiladas, made with New Mexican chile, in New Mexico are traditionally very hot! Mexican food in New Mexico is unique among Mexican foods. Delicious! Well, closes, just made for dinner ground turkey taco filling. Also make my own taco seasoning using the recipe from that guy who does all those clone recipes, could post it later if you want. Have done this for years. Its easy, no weird ingredients and you control the spices and especially the salt. I guess it kind of makes my own version of fast food tacos, uses crispy shells (2 for 3 P+)...but really, even though I live in San Diego, have never gotten tacos like that ever. Admit to going to small individual Mexican places but tend to stick to soft chicken or shrimp tacos, also i can watch them make it. Anyway, love Mexican food! I too make my own taco seasoning-chili, cumin, coriander, garlic and onion powder, no salt. I like to add sea salt to taste as well as red pepper flakes. Brown rice in lieu of meat, extra vegs like diced peppers, onion, garlic, corn, beans, plus any other veg on hand, ie diced garden gr beans, squash, tomato. I gave up on crumbling taco shells, we make 'em soft with toppings of shredded cheese, raw onion, salsa, lime zest, sour cream [just a dab]. Without meat there's still fat from the dairy just a minor player. Haven't had these in ages, must fix that! My less-kitchen-ambitious son creates burritos alot after a long day, comprised of tortilla, refried beans, corn, salsa and vegan cheese in the microwave. Love Mexican food! I always make my own taco meat - I purposely make a bunch at one time and freeze leftovers. So easy for taco/nacho night. I read on a beef website that after you cook & drain beef, rinse it with hot water while it's in the colander to remove even more fat -- it will turn any beef (80/20 or even 70/30) into (approx) 95/5 beef. I thought that was impressive information! Seems to work - I see lots of additional fat coming off every time I do it, so I'm a believer. That's what I usually do since we're big on beef taco meat at my house. I also puree a can of black beans and mix my meat about 60/40 (meat/beans) for nachos. I spread the mix individually on tortilla chips (the black beans camouflage with the meat nicely) and sprinkle cheese on top then heat in the mic or oven to melt. My kids say they "hate" beans but they eat them this way with no complaints and are none the wiser. Makes the meat stick to the chips nicely, also. I Noticed Some People Complaining About The Sodium Content In Taco Seasoning. I Am Not Advertising Any Supplier. For Mexican Food My Go To Seasoning Is McCormick's (Relatively New) "Perfect Pinch" SouthWest Seasoning (No Salt) (No Cumin). If You Want Add The Salt Also Cumin Later. These were wonderful! I took the excess corn/bean mixture and turned it into a slow cooker soup. I added lots of fresh tomatoes, a chicken breast, sliced zucchini and chopped yellow/orange peppers, and maybe 2 cups of low sodium chicken broth. It is great! Thanks again for the inspiration, Lisa!